In the opening moments of the emotionally powerful drama The Hate U Give, audiences are introduced to the Carter family sitting at the dining room table. But instead of partaking in a spirited family dinner where everyone recounts the events of their day, we observe a candid and rather uncomfortable discussion on how to properly behave when confronted by a police officer. 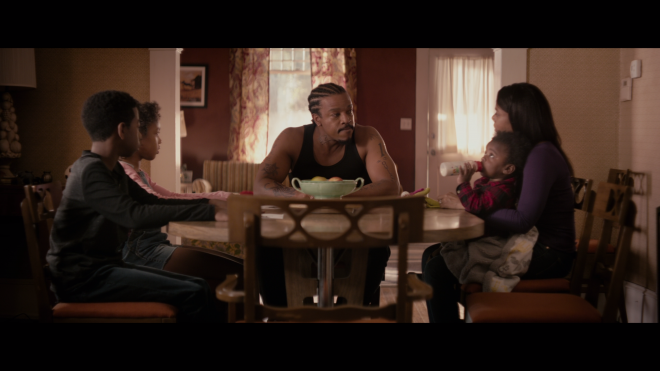 The two children being lectured by their father Maverick (Russell Hornsby), a former felon with enough experience to give his kids this life-saving lesson, are barely preteens but listen intently as their mother Lisa (Regina Hall) uneasily watches. She visibly shows she understands the importance of these instructions. And the importance seeing this painfully tense conversation immediately makes us mindful that this is a reality for many people in contemporary America, that children must be given such instructions in order to save their lives from those meant to serve and protect them. 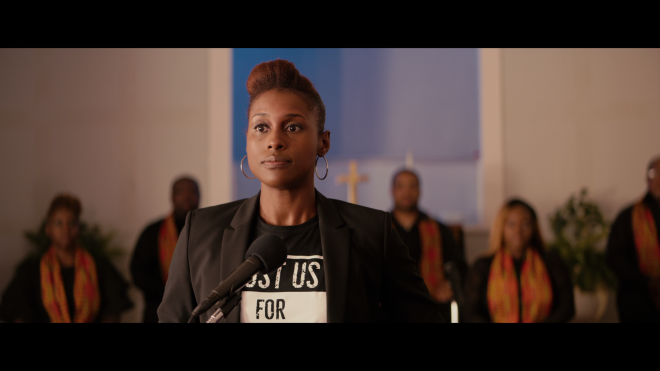 On the surface, the plot, based on Angie Thomas' equally powerful novel of the same name, directly tackles the troubling issue of police brutality and shootings, confronting the various controversies surrounding a difficult conversation that frankly, has a ridiculously easy solution. 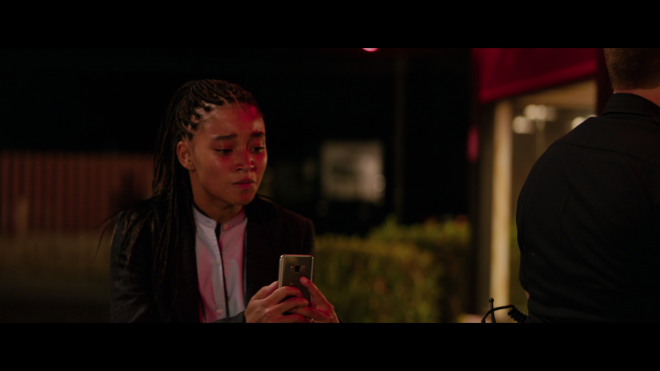 A few years after that aforementioned dinner scene, a now 16-year-old Starr (an absolutely wonderful Amandla Stenberg) sadly finds herself in a situation where her father's lessons serve their purpose. Unfortunately, her childhood friend Khalil (Algee Smith) doesn't heed her warnings and is fatally shot by a white cop who mistook a hairbrush for a handgun. That confrontation opens the discussion about Khalil's behavior, possible biases inherent in law enforcement and a system that fails to deliver on its promise of equal justice. But to focus primarily on those topical issues misses the point of Thomas' story, one that digs at a deeper, more problematic concern within society and is essentially hinted at in the film's title. 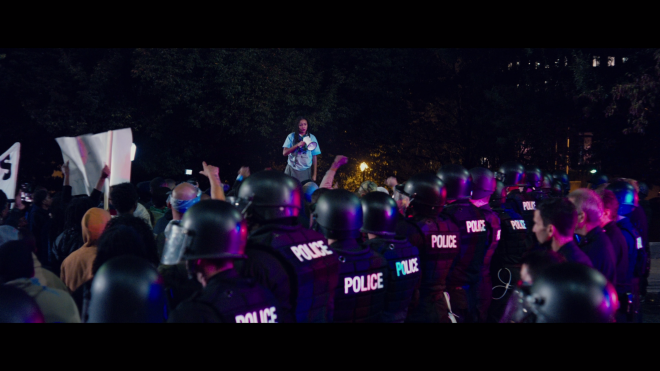 After the tragic death of Khalil, The Hate U Give becomes a heartbreaking story on the aftermath, of coping as a survivor in a society compelled to debate the gravity and criminality of the situation, exposing Starr to a new reality and awareness. Before the tragedy, Starr existed between two worlds, one as a kid of the urban Garden Heights neighborhood and the other as a college-bound student of an affluent, primarily white, private high school. Although already conscious of having to repress an aspect of her cultural identity the moment she steps onto school grounds, the codeswitch now comes with an unimaginable weight of guilt. Not only as a survivor, but also as someone unable to find a space where she can freely speak about her traumatizing experience without also exposing the other side of her reality to a judgmental and perhaps eve disapproving world. The weight is even more of a burden to carry when the kids at the school use Khalil's death to their advantage. The various instances of cultural appropriation, microaggressions, and reminders of her blackness she shrugged off at the start are suddenly disturbing examples of systemic bigotry and ignorance. While not deliberate provocations, they are nonetheless an illustration of an unwelcoming and rather hostile society not yet ready for a frank discussion of a larger problem. 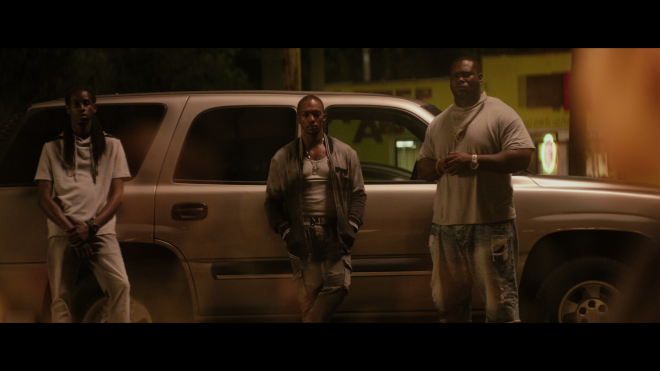 There are a few times when director George Tillman Jr.'s camerawork can feel somewhat melodramatic or lose some pace. But when on point, he delivers an emotional, gut-wrenching punch, moments leading to our young heroine's growth in discovering her unique voice, such as Starr confronting her schoolmate (Sabrina Carpenter), her talk with her cop uncle (Common) at breakfast, or Starr using her hoodie as a meaningful quiet protest. Like the family discussion at the start of the film, The Hate U Give is a candid and uncomfortable conversation about a sad reality of our society that must be addressed. 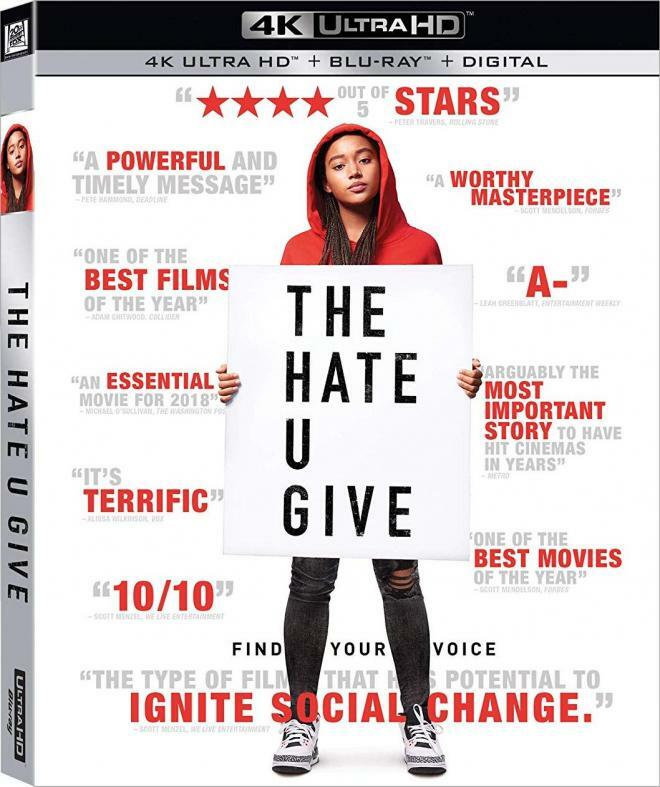 20th Century Fox Home Entertainment brings The Hate U Give to Ultra HD Blu-ray as a two-disc combo pack with a flyer for a Digital Copy, which can be redeemed via Fox Digital Movies and Movies Anywhere, unlocking the 4K HDR10 version with Dolby Digital Plus 5.1 audio. The dual-layered UHD66 disc sits comfortably opposite a Region Free, BD50 disc inside a black, eco-cutout keepcase with a glossy slipcover. At startup, the UHD goes straight to the main menu screen with full-motion clips and animation, the usual options along the bottom and music playing in the background. The poignant crime drama brings distressing social issues to the Ultra HD stage with a nice-looking HEVC H.265 encode but ultimately, doesn't offer a considerable upgrade over the Blu-ray. Shot entirely on 8K resolution cameras, the freshly-minted transfer is upscaled from a 2K digital intermediate and looking mildly sharper than the HD version. On the whole, the 2160p picture is squeaky-clean with great definition and clarity of background information. Occasionally, the sharpest edges waver and flicker in a few sequences, and resolution levels drop slightly in some wide shots while also showing a tad of noise that's still faint enough to be missed but nonetheless observable to keener eyes. Contrast, on the other hand, provides a more noticeable upgrade although the difference is similarly marginal, and specular highlights remain about the same, except for a very moderately better shine on metallic surfaces. In fact, the boosted contrast tends to run a bit hot in a few spots, creating some mild blooming and washing away some of the finer details. The only supplement shared on the Ultra HD disc is the commentary track while the rest are available on the Blu-ray, which can be read in more detail HERE. Audio Commentary: Director George Tillman, Jr. and editor Craig Hayes are joined by stars Amandla Stenberg, Russell Hornsby and author Angie Thomas for an insightful and discerning conversation about the plot's themes, performances and overall production. The Hate U Give is an emotionally gripping and powerful crime drama based on the novel of the same name by Angie Thomas. Featuring an intensely moving and spellbinding performance by the talented Amandla Stenberg, the plot directly tackles a troubling issue faced by many people, as experienced through the eyes of a young teen. Although it's not a significant upgrade over its Blu-ray counterpart, the poignant film debuts on Ultra HD with a good-looking 4K HDR10 presentation and a largely satisfying DTS-HD MA soundtrack. 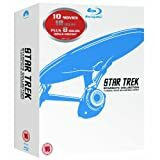 With a somewhat disappointing yet informative set of bonus features, the overall package is nonetheless recommended and sure to make a great addition to the UHD library.